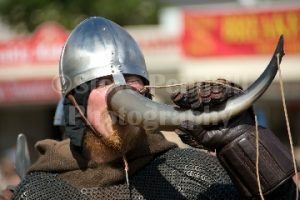 I’ve been snapping my way round another local summer event and this was my first experience of the popular Heysham Viking Festival. 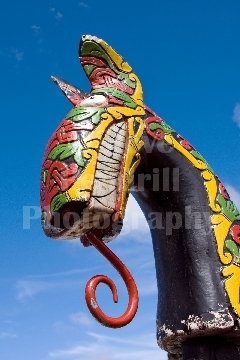 Nicely carved figurehead on one of the replica Viking longboats on display. There was an interesting mix of static displays, of traditional craft making, as well as the inevitable battle re-enactment. 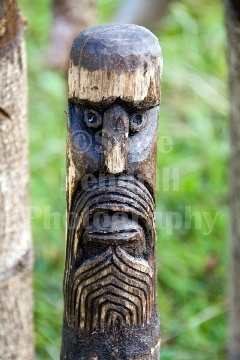 Before the hostilities, I had a wander round the viking camp…. 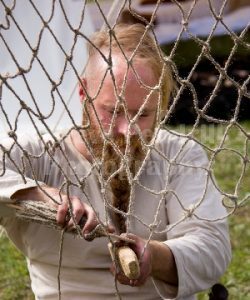 Net making, the manual way. 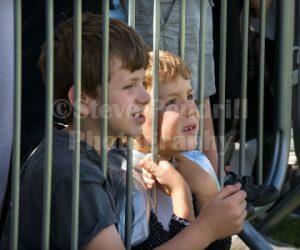 I was lucky enough to have found the camp fairly quiet, as most of the crowds were gathering on the field to watch the battle. Having a free rein to explore with my camera. My aim was to capture some authentic-looking shots to illustrate the activities and to capture the tranquil atmosphere my trusty zoom lens set for a shallow depth of focus allowed me to blur out the background. 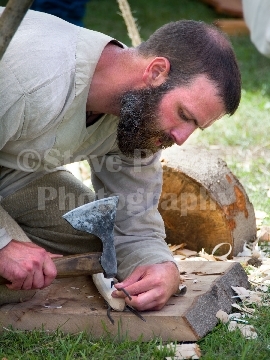 A viking carpenter in action. 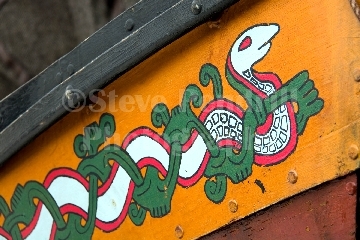 I search out the little details too and was drawn to this lovely carving. I was very impressed with the effort my friend Gillian had put into entering into the spirit of the day, looking as good as if not better than some of the ‘professional’ re-enactment group! 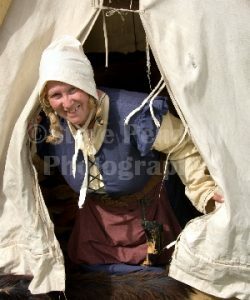 With my press photographer hat on I posed her peeping out of one of the tents. With picturesque Heysham Head and the ruin of St Patrick’s Chapel as a backdrop, how I wish the battle had been staged there. I suspect however that the village field (surrounded by very un-viking cars!) was more practical. I was only at the event briefly, so missed the parade onto Heysham Head earlier in the day, which no doubt would have also given some good photo opportunities. 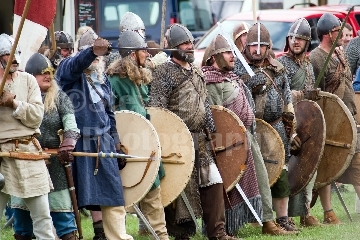 I believe, if I have my historical facts accurate, that the Viking army, having already invaded and occupied Britain were defending the country from Irish invaders. This was always one of the major challenges of an under pressure press photographer and editor, deciding when, as well as where was the best time and place to attend an event, and all that planned it into a busy diary. Thirsty work in full battle dress on a hot day. 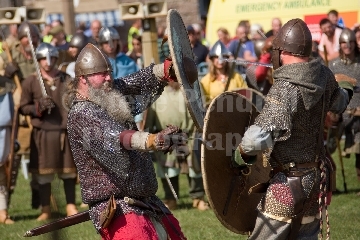 From this photo, it’s not immediately obvious what this Viking warier is doing, which added to the comedic value, I felt! 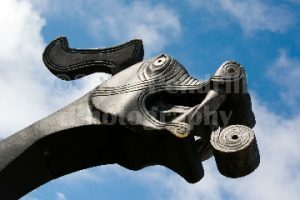 I particularly wanted to snap a close-up of an authentic looking Viking. 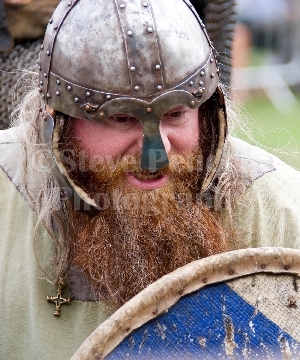 Long unkempt beards seemed to be very much the fashion (and that was just the women! lol).